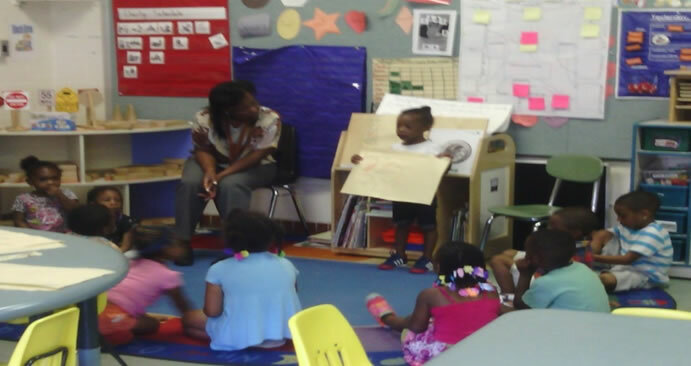 Good Start project is pleased to report a successful stay at YWCA Head Start North County St. Louis. Although the decision to work with the YWCA Head Start/Early Head Start Program in St. Louis was determined after the original site (Miles Davis Kindergarten Center) in East St. Louis failed to respond to the partnership upon my arrival in St. Louis all went well at the “Y”. The collaboration between Good Start, teachers and administrators at the Head Start Center worked well considering student success is the goal. After being introduced to the themes of the 2014 summer program (e.g., Gardening/Things that grow, Movement/Musical, and Things that Fly) I adapted my pre-K project to fit the established curriculum of the Center. Basically, I did whatever was needed. Working with two teachers in Classroom “S,” I assisted with learning activities at various work stations, during meals, play and rest times. I must say, I could not have prepared enough for the task of working in a classroom with students ages 3 to 5. I had only prepared myself for workshops and activities that I had created and designed for 5 year olds, so coming into this established environment took me a few weeks to adapt and adjust. I was surrounded by children who could barely speak. I knew I needed to remain flexible and teachable in order to make a difference in the kids’ lives. Moreover, this was not about me. Many of the students were immature and not good listeners (no surprise there). But I felt like an outsider and quickly realized that I needed to learn how to interact and engage my students where they were emotionally and socially. Although, the curriculum is Creative Learning, which disallowed worksheets, flash cards, or instruction we managed to develop skills and instill knowledge. This meant learning had to come from building, singing, clapping, coloring, and creative play. We made kites out of recycled grocery bags and talked about how things fly and even discussed superheroes that fly and went in-depth as to how Thor and Superman came to fly. Our things that fly discussion also included female super heroines, like Wonder Woman. We examined Things that grow through books about trees, plants, bees, insects and flowers. We also planted seeds in the garden and in Styrofoam cups that grew on the windowsill in the classroom. It was awesome watching the kids present to the class at such a young age. Students present their drawings of things that fly. My first day at YWCA Head Start consisted of touring the grounds and introductions. The children had planted a garden a few weeks earlier and things were beginning to grow. Daily naps/rest time is from 12:30 to 3:00 pm. During this time the kids lay down while listening to classical music. Many children fall asleep with their favorite blanket and pillow from home. Each day, I took a group of students to the garden to look for growth and evidence of other life. We observed the plants flowering and vegetables growing. Everyday was a challenge for me and I worried that I would not make a difference in their school success. I am so glad to say, I was wrong and I made a huge difference. Over the weeks, I watched immature sometimes unruly kids develop emotionally and socially. They went from being unfocused and weepy to confident secure smart students. I was impressed. I knew that if African American Children were privileged (attended pre-K and received support) they would be ready for kindergarten and less of a disciplinary threat. As the final days came for me at the Center and school supplies were being delivered by the cases, I was excited and sad. I passed out the backpacks and school supplies for those kids heading off to kindergarten. As each one came into the room with their parent, I shared their names and a little bit about them with their caregiver. I then realized, I had become a teacher and had gained experience and knowledge beyond my thesis. Since, wrapping up the Good Start project, I have made contact with other YWCA staff, social workers, professors and friends regarding my experience at head start and my desire to do it again next year. I was also able to donate a few backpacks to the Wesley House in St. Louis and Miles Davis Kindergarten Center in East St. Louis (my inspiration). I have received a wonder gift from these children and I am honored to know first- hand that African American children from underserved communities do learn, are smart, kind, and important to this world. As I go forward in my career in public affairs and education, I take these kids with me and I am reminded that I grew up just like them. So, my story is their story and my success their success and I want for my sisters and brothers what I want for myself. Thank you PNME for helping me learn from some of the children in St. Louis and East St. Louis.